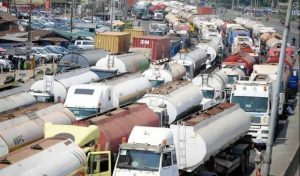 The Director- General of the Nigeria Employers’ Consultative Association (NECA), Olusegun Oshinowo, has blamed the perennial gridlock in Apapa on overstretched infrastructure. Oshinowo who spoke in Lagos, said that growth rate was not factored early enough to keep up with growth and development. The Population is going up and investors are coming into the country to take advantage of opportunities, so infrastructure of 15 years ago would not be enough for the demand of today. Nobody ever thought that a time would come when we would have as many tank farms as we have in Apapa. What we have in Apapa now is simply an accumulation of problems of 20 years,’’ he said. Mr. Oshinowo also noted that the same overstretch infrastructure existed in the aviation sector, adding that the government must think of expansion programmes that would cater for the dynamics of the nation’s growing economy. He said the accumulated problems of years of neglect could not be resolved overnight. Graduation Ceremony of Students of LASTVEB/NECA-ITF TSDP in the Construction Trades.